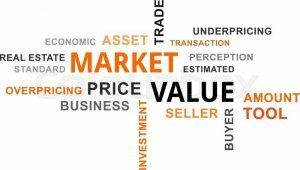 How to Determine Asheville Market Value? While many homeowners have a general idea of what they think their home is worth, that number may or may not be accurate. In reality, the value of a home is based upon far more than personal attachment and gut feeling. In this episode of Whiteboard Wednesdays, we’ll take a look at how we determine market value on a house, and how you can determine whether your valuation of your home matches up with the numbers! So, what exactly is Asheville market value? Very simply, it is the amount that a home can be sold for in a specific market. As with anything else in a marketplace, this value is determined, at the end of the day, by what buyers are willing to pay. can make an informed decision about how much a property will be worth given the period of time that it might take to sell after it’s been purchased and fixed up. 2. Price per square foot. We look at comparable properties in the same market and establish an average of their prices per square foot, in order to establish an understanding of what this same value should look like for a particular property. 3. Price-to-close. By looking at the difference between the price that comparable properties were listed for and they ultimately sold for, we can determine how competitive the market is and what the true market value of a property may be. While these three factors offer a solid starting point for determining Asheville market value, they don’t account for every variable. A small but luxurious home, for example, might fall markedly outside of the typical price per square foot, but be well worth the higher price tag. With that in mind, we take a close look at each individual house in order the ensure that we accurately evaluate market value for every unique property. To learn more about market value and Asheville Cash Buyers, give us a call at 828-222-6443 or visit www.AshevilleCashBuyers.com!